District Six in Cape Town was declared a ‘whites only’ area on 11 February 53 years ago — paving the way for a mixed community to be destroyed and forcing residents into areas on the Cape Flats — where they still live, waiting for the day they can be moved back into their much-loved area. While there has been contestation and disagreement, it was agreed on Monday at a commemoration event that people needed to be moved back to the area to finally start a healing process, more than half a century later. February 11 marks the anniversary of District Six — a multicultural and multiracial community in the heart of Cape Town — being declared a “whites only” area under the apartheid Group Areas Act. On Monday, which marked the 53rd anniversary of the proclamation, about 500 former residents and their families gathered at the Castle of Good Hope to commemorate this date. On Monday, speakers relayed their experience of living in the area and how much pain the forced removals had cost not only them but their families. “All of us want to go back to grow the seeds we planted,” said former resident Imam Fahiem Isaacs. As he spoke of how District Six had been a close-knit community, some in the crowd began to cheer and clap. 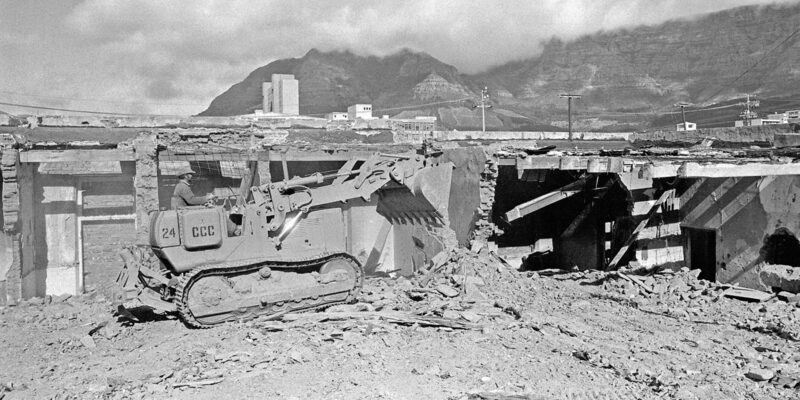 “One day, I believe we will move back into District Six, because God the Almighty never sleeps,” said Isaacs, who referred to restitution claimants who had died before they could move back into the area. Read from Daily Maverick’s archives: District Six claimants ask court to force government to admit it failed them. Two weeks before the commemoration, 93-year-old Katherine Wagner, the oldest District Six claimant, died before she could back into an area she had grown up and lived in. Ajam was nine years old when District Six was declared a “whites only” area. When he was 19 his family was removed and sent to live in Hanover Park. Ajam, with the working committee, organised Monday’s event with financial help from the City of Cape Town. In his address to the crowd, mayor Dan Plato described the remembrance of the date as “painful”. “In the years before that day this community, District Six, was a happy place… It was a warm place where neighbours knew one another and a sense of pride and community was strong,” said Plato. It was announced at the commemoration that the working committee would be back at the Land Claims Court in the Western Cape High Court on 26 February 2019. This comes after Judge Jody Kollapen ruled the Department of Rural Development and Land Reform must provide a timeline for claimants who had wanted to move back to the area. There are 1,062 claimants from District Six who have refused financial compensation and instead want to move into housing units in the area. Initially, 2,760 District Six restitution claims were lodged and verified with the Land Claims Commission, of whom 1,449 claimants chose financial compensation. In June 2018, Daily Maverick reported between 2004 and 2018 there had been 139 housing units built for those who wanted housing in District Six. After the November 2018 court hearing, the court set aside a judgment on two orders: For the government to admit it had failed former residents and the other to finalise the costs of the legal battle. Read Daily Maverick’s report on the November court hearing here. Former District Six resident and present Western Cape MEC for Social Development Albert Fritz (who was standing in for Premier Helen Zille) aptly described the devastating impact of forced removals.